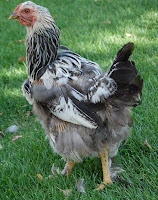 Molting Chickens: It Ain’t Pretty! My chickens are about 1-1/2 years old and have stopped laying eggs, but I’m not concerned. This is a molting chicken! Click photo for a closer look. You see, this is fall, when chickens molt. They are losing their old, sometimes tattered feathers and replacing them with new ones. Last year Jenny was the only one to molt and it seemed like her feathers fell out by the hundreds. Some chickens molt that way while others just lose a few dozen feathers here and there. Tiggy is also a big feather dropper. She molted early, in mid August. Flopsy and Mopsy started in early October are taking their time. Chickens stop laying eggs (ovulating) when they’re in a molt. Their bodies need to redirect that energy into making beautiful new feathers. Once they’re done molting, they’ll start laying again. In the meantime, I’ve added a little more protein to their diets to help their bodies with feather production. I’ve been giving them (canned) mackerel or tuna, leftover soups, meats, fish and pasta. No chicken though, I can’t go there. After the molt. Isn’t Tiggy gorgeous? Here are a couple of things I’ve also learned this year: When chickens are not laying eggs, their combs tend to lose color. My guess is that a chicken’s comb is a “flag” to attract roosters when they’re ovulating. The girls also don’t “squat for the king” when I walk by, another sign they are not ovulating. Tiggy became broody early this summer, sitting in the nest box for months trying to hatch invisible eggs. Her comb also became very pale, she lost her squat and was not laying. Now she’s back to normal and I’m just waiting for the rest of the girls to get their groove back! In the meantime I’ve been buying free range chicken eggs at the grocery story and just hoping that their definition of “free range” is in the same vicinity as mine. January 2013 update: I was going to put a light in the chicken run after the winter solstice to get the girls laying eggs again. I figured a couple of months off duty would be enough. But to my surprise, about a week after the solstice they started laying again! I guess that teensy extra bit of sunlight kick-started their hormones. February 2013 update: I noticed this Sunday that the girls’ combs were not as bright red as they’d been lately. We were having a snow storm and they were out in the cold and blowing snow. I brought them into our sunroom for a while jus to give them a break. Pretty soon their combs were a luscious red again. So… temperature also affects comb color. 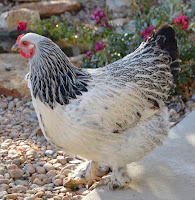 This entry was posted in chicken feathers falling out, chicken has pale comb, chicken losing feathers, chickens not laying eggs, molting chicken on November 6, 2012 by Farmer Deb.